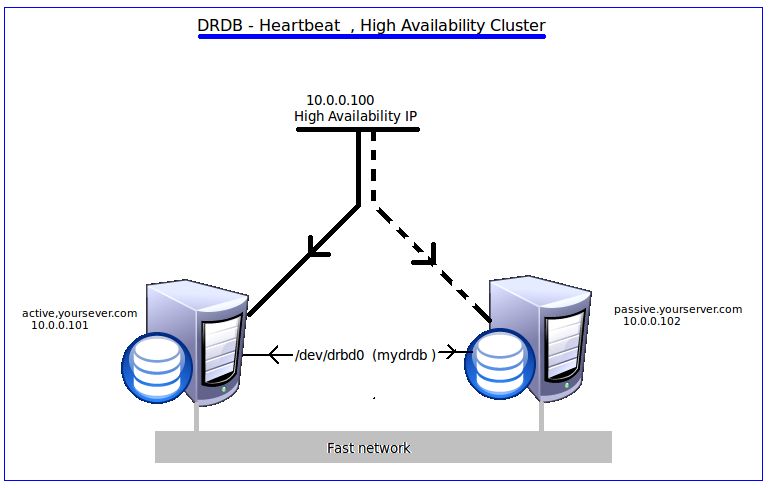 DRBD – Heartbeat cluster a good Active / Passive cluster solution for small scale applications using two servers in active and passive mode. This means , only one server will work at a time while keeping the other server as a backup with realtime data updates. DRBD is a kernel level service which will replicate your block devices ( HDD partition ) with the second server. So all the data that required for working your application must be need to place in that hard disk partition. Also make sure that both of your servers need same amount of free space. Heartbeat is a service which will manage the IP high availability and other services in your servers. You can also integrate CRM along with heartbeat for your big cluster projects. Please see the pictorial representation of this cluster below. Passive Server : 10.0.0.102 -> This will be your passive server , means backup server. In both active and passive server we need a hard disk partition , let us say /dev/sdb1 with equal amount of disk space. The DRDB service will synchronize the hdd partitions via a drdb block file called /dev/drbd0. So keep in mind that this drdb block files is always refers to your original disk partition. So we are going to build this Active passive services with high availability. You may need Centos 5.x or later version , because Centos already have drbd and heartbeat as binary distributions, otherwise you need to compile and install drbd and heartbeat from source. You may need to disable SELinux your server and remove iptable firewalls. Also you need to edit /etc/hosts file in your active and passive servers as follows and make sure it is pointing to correct IPs. Now you need to unmount your disk partition /dev/sdb1 and remove it from /etc/fstab too. We will erase this partition in the coming sessions. Also create a folder called /data, which we will use as mount point of drbd devic. Let us install drbd first . You may need to install it in both servers and the drdb configuration must be unique. If it is not working, there will be some issues in your installation procedure. If all ok let us proceed with the next step. /etc/ha.d/authkeys -> Hearbeat servers authentication keys. The first term active.yourserver.com means all the following services must be available in active server, if that server is available. So our heartbeat installation completed. The DRBD is already running. Let us start hearbeat service in both servers. Within one minute the HA IP will be available in your active server, also you can see the drbd partition /dev/drbd0 mounted to /data and mysql and httpd services are up and running. Now stop the heartbeat server in active node and you can see the IP is activating in the passive server and it is starting the mysql and httpd services . Also the DRDB partition will be mounted in your passive server. So now you can put what ever data to the folder /data, after mounting the partition /dev/drbd0 by the heartbeat. It will be replicated to other sever. This is a block replication method. So if you have a corrupted file in one server, it will be same in your other server too. So take care with your application. You can use the above active/passive high availability cluster for service like atmail , vbulletin , openx, etc,. It is also possible to move the mysql database to the DRBD partition too. But mysql master-master replication cluster is also good. Also make sure you may meed to connect the NIC with fast switches or cables , to move files faster. I am not sure you will read this conclusion lol . If you do so , and you have any questions, please feel free to ask to me from the above contact page. While creating the disk getting below error. Can you please help. ‘/dev/sdb1’ is not a block device!